OVC is to proud to announce the start of our TOPSOCCER Program. If you know anyone that might be interested please invite them out to Flying Hills. Session is held every Thursday from 4:30 to 5:30. Please see flyer below for more information. 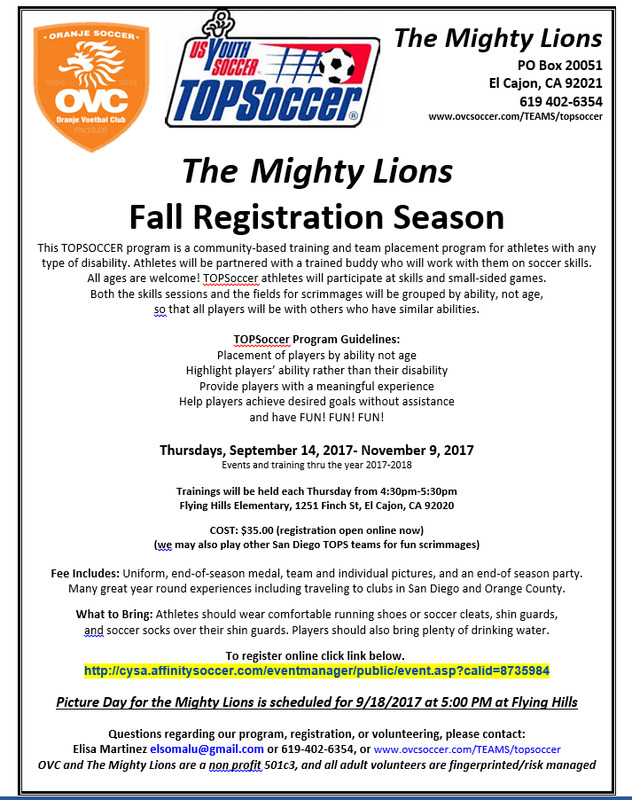 The TOPSOCCER program is a community-based training and team placement program for athletes with any type of disability. Athletes will be partnered with a trained buddy who will work with them on soccer skills. All ages are welcome! TOPSoccer athletes will participate at skills and small-sided games. Both the skills sessions and the fields for scrimmages will be grouped by ability, not age, so that all players will be with others who have similar abilities.